Rediff.com » Business » How much diamonds were imported in April-November? How much diamonds were imported in April-November? Two entities under the Union ministry of commerce report differing figures for import of cut and polished diamonds for the first eight months of the financial year. A controversy has been created after two entities under the Union ministry of commerce have reported differing figures for import of cut and polished diamonds for April-November 2017, first eight months of the financial year. Kolkata-based Directorate General of Commercial Intelligence and Statistics (DGCIS) reported $6.3 billion. The other agency, Gems and Jewellery Export Promotion Council (GJEPC) showed net import at $1.5 bn. The ministry has called a meeting with both on Thursday next. India is traditionally a major exporter of polished diamonds. GJEPC says of the polished diamonds import, $4.9 bn was returned unsold and that cannot be considered an increase in import. Said its spokesperson: "The total figure of $6.3 bn comprises two distinct categories, of Actual Imports and Return Consignments, both terms officially used in trade parlance and by the Customs department." In diamonds, a lot of export is on a consignment basis, said the spokesperson. Meaning that if goods are sent for an exhibition or marketing and bought by a client, it is treated as export; else, it is brought back. DGCIS compiles data for all commodities; GJEPC is industry-specific. Return consignments comprise gems & jewellery taken abroad for exhibition, export promotion or brand promotion, and those sent abroad for certification by international laboratories. Such returns need not comprise only diamonds. The figures for return consignments recorded by GJEPC are $4.9 bn in April-November, almost the same as a year before. Says GJEPC: "Consignment imports cannot be termed imports in a real sense. These are goods that go out of the country but may come back if unsold or are meant to come back in the case of certification and so, at Customs, no import duty is also levied." 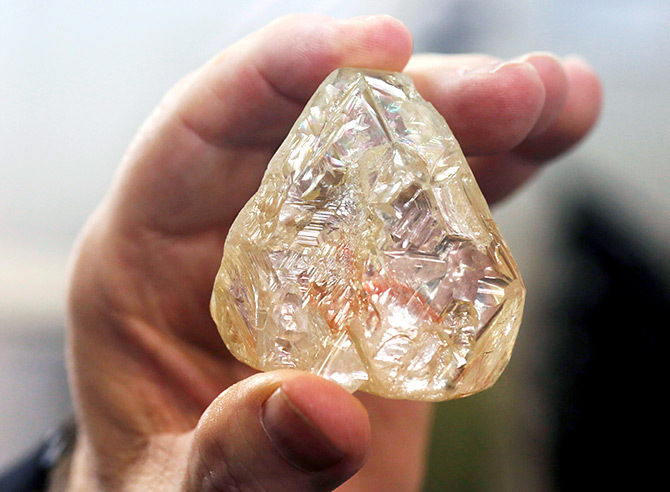 Some industry insiders doubt the return consignment data, as the diamond industry has always seen hawala (back channel) trade, use of import-export for money laundering and round tripping (when an item is sent abroad but with an agreement to buy it back at a similar price). Till 2012, laundering was rampant in diamonds but after the government imposed a 2.5 per cent import duty on polished ones, this changed. Round tripping will almost stop with the Union Budget proposing to double the import duty for polished diamonds to five per cent. Trade sources say mis-declaring of import and export is common but the council's spokesperson denies that happens on a large scale. Alleging inaccurate data from DGCIS, the council said these "had been brought to the notice of the government by GJEPC through an official communication dated February 14". Diamonds are now fraudsters' best friends!